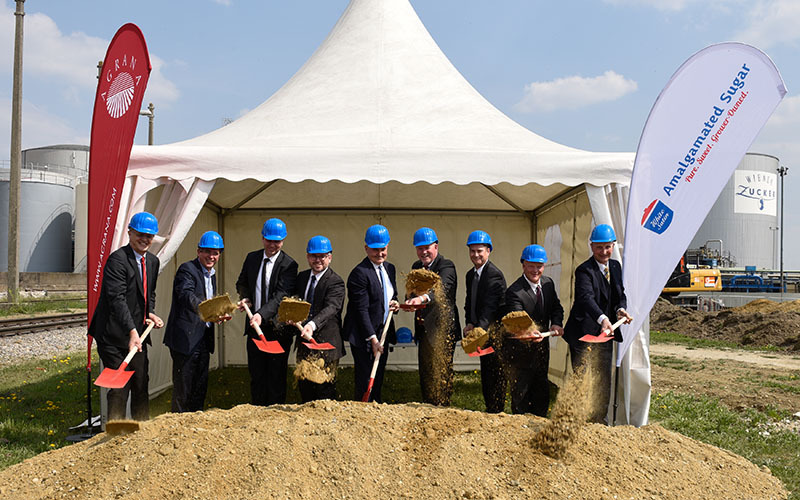 The fruit, starch and sugar group AGRANA is constructing a betaine crystallisation plant at its sugar refinery in Tulln (AUT) under a joint venture with US-based Amalgamated Sugar. The fruit, starch and sugar group AGRANA is constructing a betaine crystallisation plant at its sugar refinery in Tulln (AUT) under a joint venture with US-based Amalgamated Sugar. The official ground-breaking ceremony for this project took place on April 9th. The new plant, entailing the investment of around € 40 million, will take a year to construct. AGRANA has been processing the sugar beet molasses obtained during the production of sugar at its Tulln site to make liquid betaine since 2015. The new plant, with a production capacity of around 8,500 metric tons of crystalline betaine per year, will make Tulln only the third manufacturing site worldwide where premium-quality, natural crystalline betaine is produced. “We are looking forward to a successful partnership to produce premium-quality crystalline betaine. Diversification by means of betaine in our Sugar segment is essential to ideally exploit the full potential of sugar beets. This investment in a greater depth of sugar refining is therefore a top priority in the interests of safeguarding competitiveness,” as the CEOs of AGRANA and Amalgamated, Johann Marihart and John McCreedy, both agree. The natural substance betaine, found in sugar beet molasses, is characterised by numerous positive properties and can be used in many applications. Betaine is a methyl donor and has osmoregulatory properties, aids the liver to process fats, and biologically degrades the amino acid homocysteine, which can damage blood vessels when in high concentrations. Betaine is used not only in food supplements and sport drinks to promote muscle development, but also in livestock rearing as a component in animal feeds. Due to its osmoregulatory properties at a cellular level, betaine is also used in cosmetic products. In tensides and detergent substances (e.g. shampoos and conditioners), betaine acts to stabilise the formation of foam and also conditions and strengthens the hair.